Calgary Pride is urging the police service to take diversity training. People march in the Calgary Pride parade in Calgary, in 2013. CALGARY — Uniformed police officers will not be marching in Calgary's annual Pride parade in September. Calgary Pride said Wednesday that it encourages police to take part, as long as it's without uniforms, firearms, vehicles or institutional representation, such as floats. "We acknowledge the historical oppression and institutionalized racism faced by queer/trans people of colour and Indigenous persons, and the potentially negative association with weapons, uniforms, and other symbols of law enforcement," the group said in a news release. "We also recognize the oppression of the gender and sexually diverse community at large, the discrimination faced by members of law enforcement who identify as part of the (gender and sexually diverse) community and the challenges they may have encountered as a self-identified (gender and sexually diverse) community member in the workplace." 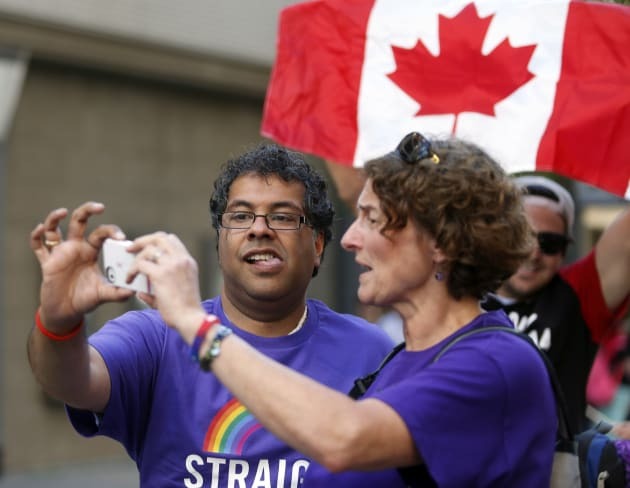 Calgary Mayor Naheed Nenshi and another marcher take a photo while marching in a gay pride parade in Calgary in 2013. Calgary Pride said it also wants top brass at the Calgary Police Service, including Chief Roger Chaffin, to have formal diversity and inclusion training. As in past years, the group said police will provide security at the Sept. 3 parade, which attracts more than 60,000 spectators. "We believe banning (the Calgary Police Service), and other law enforcement agencies from participating in Calgary's Pride activities deters from engaging in meaningful discussions on how law enforcement agencies can best support Calgary's gender and sexually diverse community," Calgary Pride's release said. "We welcome the participation of Calgary Police Service, and other law enforcement agencies in a manner that demonstrates allyship and understanding." The Calgary Police Service said it will have an entry in the parade, but will respect the request that no uniforms be worn. "We are obviously disappointed with the decision that police will not be allowed to march in uniform, but we are not going to allow it to undo decades of progress between law enforcement and the LGBTQ community in Calgary," Chaffin said in a statement. "We have a far better relationship with the LGBTQ community now than we did even ten years ago and we want to keep that forward momentum." VOICES, a group that describes itself as "Calgary's coalition of two-spirit and racialized LGBTQIA and their chosen allies," said it had collaborative discussions with Calgary Pride and Calgary Police. LGBTQIA is an abbreviation that refers to lesbian, gay, bisexual, transgender, queer, intersex and asexual people. "What we have here is a symbolic step which does not eliminate police violence and misconduct, but rather opens up a discussion and first steps towards creating a community that is safe for all and the one that truly honours the history of what Pride marches are meant to be," the group said in a statement. Law enforcement involvement in Pride events has stirred controversy. 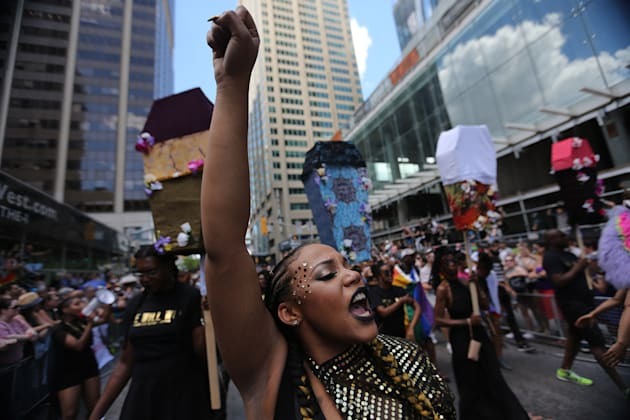 In January, Pride Toronto organizers agreed to a list of demands from the city's chapter of Black Lives Matter, including a ban on uniformed officers and police floats in the parade. The issue first came to widespread public attention during last year's parade, when members of the anti-racism group staged a sit-in that halted the march until Pride organizers agreed to a list of conditions. Black Lives Matter march during the 2016 Toronto Pride parade. Pride Winnipeg invited police to march in its parade in June, but without cruisers or uniforms. Halifax police opted out of last weekend's Pride parade, citing the national debate on the topic. In Vancouver, officers will be allowed to march as part of the city's contingent Aug. 6, alongside city municipal staff and other first responders. But no marked cruisers will be included and most of the marching officers will wear T-shirts rather than uniforms. In St. John's, N.L., the Pride committee reversed course and invited uniformed police officers to march in the city's parade, which was held earlier this month.